RICHARD SOLOMON ARTISTS REPRESENTATIVE: Eric Drooker // "The Fight Begins"
In lieu of the recent political tension in the United States, and how ruthless contenders can be towards one another, artist Eric Drooker skillfully portrays the two major parties in this cover for The New Yorker. 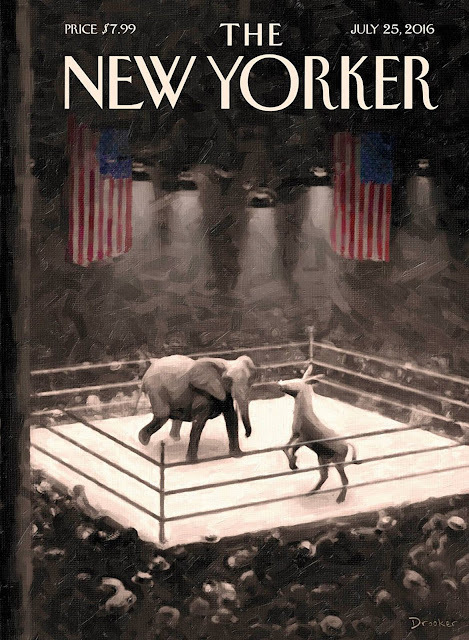 Each corresponding infamous symbols (the Democratic Party as a donkey, and the Republican Party as an elephant) are shown engaged in a fighting ring where only one will win. Eric comments on his work perfectly summarize this image in this article by The New Yorker. Be sure to pick up your copy when it hits stands Monday July 25th! Great job Eric!